The liturgy describes Saint Bernard as a man all ablaze with zeal for the house of the Lord. The little phrase, “inflamed with zeal,” tells us, in effect, that God gave Saint Bernard to the Church as a new Elias, the ardent prophet given to Israel of old. When Elias was on Mount Horeb, the Lord visited him in “the whistling of a gentle air” (3 Kings 19:12). “And when Elias heard it, he covered his face with a mantle, and coming forth stood in the entering in of the cave, and behold a voice unto him, saying: ‘What dost thou here, Elias?” And he answered: ‘With zeal have I been zealous for the Lord God of hosts'” (3 Kings 19:14). By way of Psalm 68:9, one of the great prophetic psalms of the sufferings of Our Lord, the same expression, “inflamed with zeal,” identifies Saint Bernard with Our Lord Jesus Christ in the mysteries of His Passion. After Jesus had driven the moneychangers out of the temple, His disciples remembered that it was written, “The zeal of thy house hath eaten me up” (Psalm 68:9). The same burning zeal for the glory of the Father was to consume Jesus in the holocaust of His Sacrifice on Calvary. 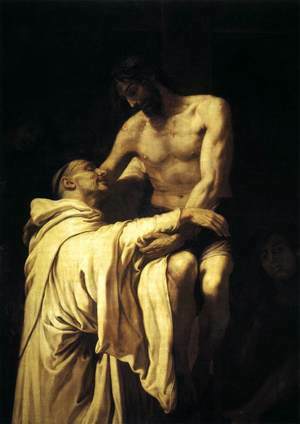 The traditional iconography of Saint Bernard shows the monk held fast in the embrace of Jesus Crucified, who detaches His arm from the cross to draw Bernard to himself. The theme of the amplexus, or mystical embrace, is repeated in depictions of Saint Bernard again and again. 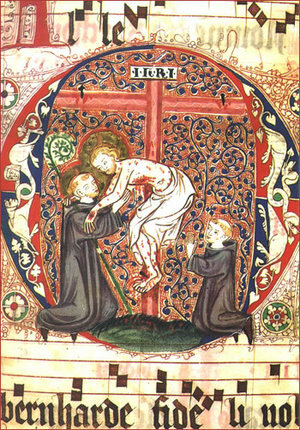 The fire that burned in the pierced Heart of the Crucified passed into Bernard, filling him with an astonishing capacity to suffer and to love for the Church, Christ’s Bride and Mystical Body. Zeal, then, characterizes Saint Bernard. A burning passion for Christ and for the Bride of Christ, the Church, consumed him. In Chapter 72 of the Holy Rule, Saint Benedict distinguishes between two kinds of zeal. The first he calls “an evil zeal rooted in bitterness, which separates from God and leads to hell” (Rule 72:1). Evil zeal — coldhearted, pharisaical, and grim — always leads to rancour and strife in a community. Good zeal “separates from vice and leads to God and to eternal life” (Rule 72:2). The Holy Ghost infuses the grace of good zeal into souls. Good zeal is gentle, and winning, and sweet. It is warm and attractive. It inflames others but it doesn’t scorch them. It attracts souls by means of a gentle, steady radiance. The fire of a prophetic charism made Saint Bernard burn and shine in the Church. In the 5th Chapter of Saint John, Our Lord, speaking of the Baptist, says, “He was a burning and shining lamp, and you were willing for a time to rejoice in his light” (John 5:35). Like the Holy Forerunner, Saint Bernard was, and remains even today, a burning and shining lamp set upon a lampstand in the Church so that all might enjoy his brightness. By burning, he enkindled others; by shining, he enlightened others. Those who read the works of Saint Bernard know that his fire has not been extinguished nor has his flame become less bright. When the Holy Ghost sets a heart aflame, nothing earthly can extinguish the blaze. “Love is strong as death,” says the Canticle, “the lamps thereof are fire and flames. Many waters cannot quench charity, neither can the floods drown it” (Canticle 8:6-7). Many waters and great floods have come and gone, assailing the Church over the centuries, and sweeping away the grandest monuments in their torrents. Still, after the nine centuries that separate us from Saint Bernard, his fire burns with the same intensity and his light is undimmed. It was said in the twelfth century that Saint Bernard was — spiritually — the most contagious man alive. 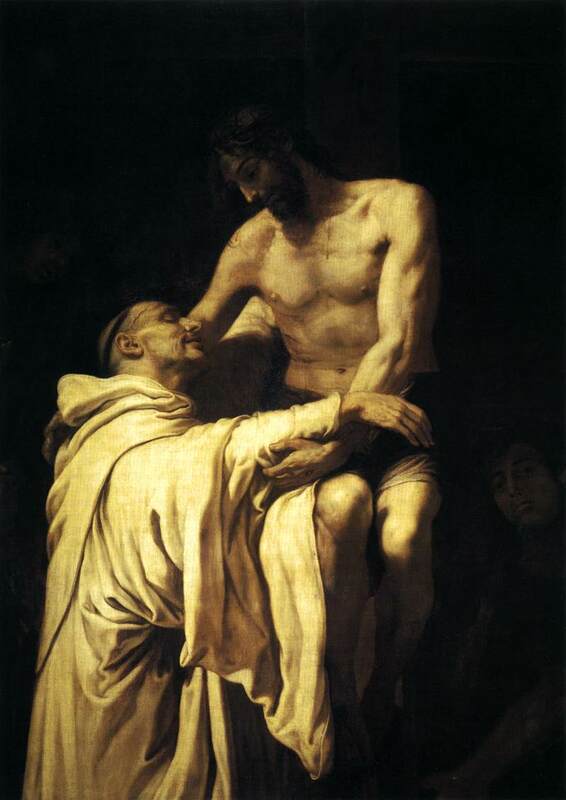 So powerful was his very presence that when Abbot Bernard of Clairvaux passed through a village or town, women would hide their husbands and sons, fearing that their menfolk, seduced by Bernard’s preaching, might abandon wives and mothers, children and homes to follow him into the cloister. And so it happened! When Saint Bernard preached in the universities, the lecture halls would be packed with eager young listeners. Scores of students would follow him, like a kind of monastic pied-piper, begging for the grace of the holy habit and for a place in his abbey. When Saint Bernard preached, fire leaped out of his mouth into the hearts of his hearers and, when he explained the Scriptures, souls were flooded with light. Like John the Baptist hidden in his mother’s womb, Saint Bernard received the grace of Christ and grew in it, day by day, through the mediation of the Blessed Virgin Mary. “This, he says, “is the will of Him who wanted us to have everything through Mary…. God has placed in Mary the plenitude of every good, in order to have us understand that if there is any trace of hope in us, any trace of grace, any trace of salvation, it flows from her…. 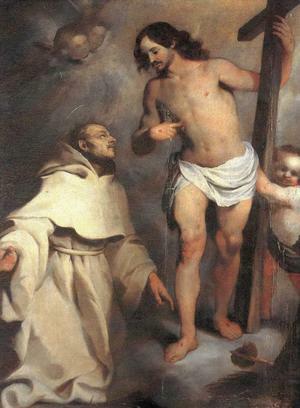 God could have dispensed His graces according to His good pleasure without making use of this channel (Mary), but it was His wish to provide this means whereby grace would reach you.” This not mere theological speculation on the part of Saint Bernard, it is testimony to his personal experience. For Saint Bernard the Virgin Mother is the Mediatrix of All Graces. All that comes to us from Christ, our one Mediator with the Father, comes, necessarily, through Mary, Mother of us all, and Mediatrix with the Son. Again like Saint John the Baptist, Bernard saw himself as “the friend of the bridegroom who rejoices greatly at the bridegroom’s voice” (John 3:29). Saint Bernard heard the voice of the Bridegroom in Sacred Scripture proclaimed, and sung, and held in the heart during long hours of the Opus Dei. The friend of the Bridegroom never seeks to draw the bride to himself or to possess her in any way; his whole desire is to hear the bride say: “As the apple tree among the trees of the woods, so is my Beloved among the sons. I sat down under His shadow, whom I desired, and His fruit was sweet to my palate. He brought me into the cellar of wine, he set in order charity in me” (Ct 2:3-4). The friend of the Bridegroom is jubilant when the bride is brought into the banqueting house; there, the banner of love is raised over her head. Bernard, the friend of the Bridegroom became the servant of the Divine Hospitality; he was, in truth, the herald of the Bridegroom-King sent out of his cloister into the streets and lanes of the city, into the highways and the hedges, at the hour of the wedding banquet, to bring in “the poor, and the feeble, and the blind, and the lame” (Luke 14:21). Ecclesiasticus describes Divine Grace coming in the form of a mother and of a virgin bride to meet Bernard. What is warmer than the welcome of a mother? And what more enthusiastic than that of a young bride? Again, the grace of Christ came to Saint Bernard through Mary. “With the bread of life and understanding, she shall feed him, and give him the water of wholesome wisdom to drink: and she shall be made strong in him…. And in the midst of the Church she shall open his mouth, and shall fill him with the spirit of wisdom and understanding, and shall clothe him with a robe of glory” (Ecclesiasticus 15: 3-5). “By what doth a young man correct his way? By observing thy words” (Psalm 118:9). The Abbot of Clairvaux knew that when God speaks, He communicates Himself. For Saint Bernard to be steeped in the Word of God was, as Origen teaches, to be steeped in the very Blood of Christ. Saint Bernard’s lifelong attraction to Sacred Scripture was an expression of his lifelong attraction to the Sacred Side of Jesus, the wellspring of purity and of love. 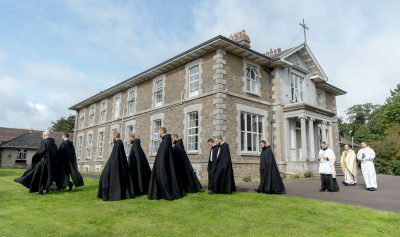 The effect of the monastic life, with its relentless immersion in the Word of God, is that the soul loses herself, her own words, desires, inclinations, and aspirations in the prayer of the Heart of Jesus to the Father. One seasoned in monastic life begins to be able to say, “It is no longer I who pray, but Christ who prays in me.” In the presence of the Father, the soul shaped by the monastic tradition has no words apart from the words of the Word, uttered in the power of the Holy Ghost. And this, of course, is the great reality of the Holy Sacrifice of the Mass. When the priest goes to the altar as the representative of Christ and of the Church, he lifts his hands in prayer. At that moment, it is no longer we who pray for ourselves and by ourselves. It is Christ the Eternal High Priest who, through the priest standing before the altar, prays for us to His Father. 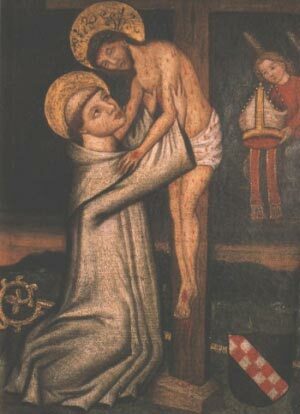 In every Mass, too, the embrace of Jesus Crucified is offered to each of us as it was offered to Saint Bernard. Detaching His arm from the cross, Our Lord draws us sacramentally to the wound in His Sacred Side. Through that mystic portal we pass over to the Father, in the Holy Ghost. 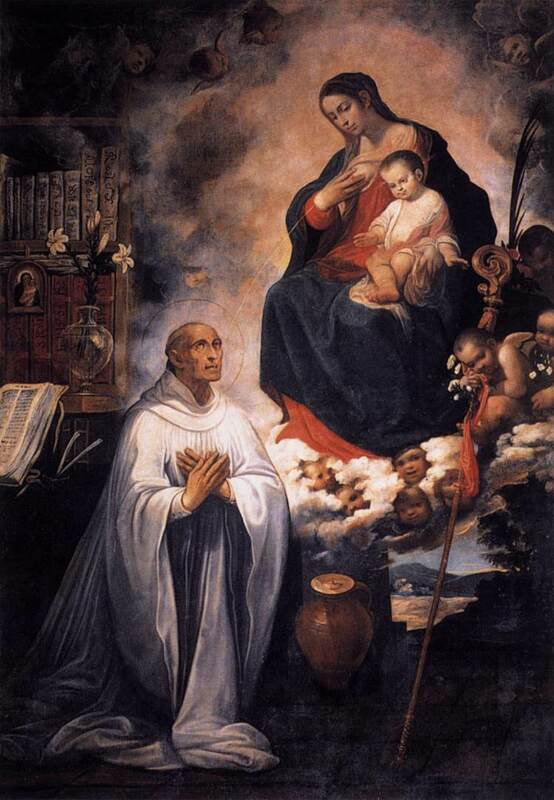 The secret of Saint Bernard was this: guided by the Virgin Mother of Jesus, he yielded to the embrace of the Crucified and drank deeply from His open Side. May Mary, “our life, sweetness, and our hope,” obtain that same grace for us today.